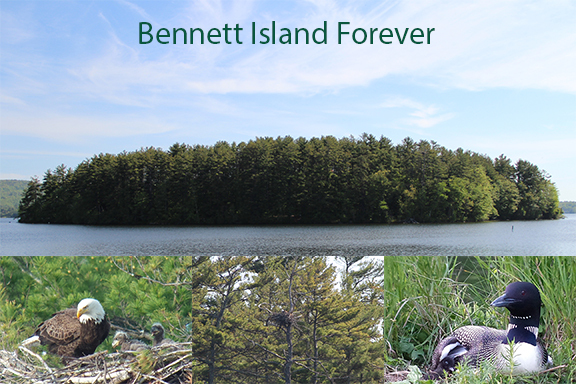 Help us Conserve Bennett Island Forever! Migrating flamingos are flocking! "Flocking," as it has become known, is the fund-raising effort that accounts for flamingos showing up on lawns all over the country - most recently in Strafford and Northwood, New Hampshire. All proceeds benefit the Bennett Island Forever Campaign and Bear-Paw Regional Greenways’ land protection program. Here's how it works: Someone contributes $50 to the Bennett Island Forever Campaign to place a flock of 25 pink plastic flamingos on one of their friend’s or neighbor’s lawn (or somewhere else) for a day ($100 for a flock of 50 flamingos). The recipient gets a pink sign explaining the rules and an opportunity to return the favor. For another donation the recipient may choose to send the flamingos on to their next destination. The donations are, of course, voluntary. For an additional donation of $50, Flamingos may migrate to other Bear-Paw towns (Allenstown, Barnstead, Candia, Deerfield, Epsom, Hooksett, Nottingham, Pittsfield, and Raymond - depending on availability). 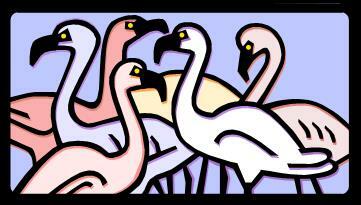 You can even contribute $250 to have a 100 flamingo invasion visited upon one of your friends! All proceeds will benefit the Bennett Island Forever Campaign and the land protection program of Bear-Paw Regional Greenways. We need to raise $200,000 to permanently protect the island. The Bennett Island Forever Campaign is our biggest private fundraising effort ever and will continue through June 2017. Click here to order your flamingos online and click here to make a secure, online contribution for the Bennett Island Flamingo Flocking or mail your check to Bear-Paw Regional Greenways, Post Office Box 19, Deerfield, NH 03037 and indicate “The Bennett Island Project Flamingos” in the memo section. (Unfortunately, our ordering system and payment system are not connected yet!) If you have any questions about this campaign or if you would like to get involved, please contact the office at 603-463-9400 or info@bear-paw.org! If you come home and find flamingos migrating through your yard, you have been flocked! Someone contributed to the Bennett Island Forever Campaign for the chance to place a flock of pink plastic flamingos on your lawn. All proceeds benefit the Bennett Island Forever Campaign and Bear-Paw Regional Greenways’ land protection program. Click here to learn more about how you can order a flock of flamingos!